Delta reports earnings soon, and I bet they tell a decent story. Buy the DAL stock dip now. In early February, the stock market had a sharp correction on the headline of an overheated jobs report. But since then, we’ve had a slew of political headlines threatening global growth, which exacerbated the situation. This morning is a perfect example as stocks are falling again on yet another headline From President Donald Trump about escalating tariff amounts. 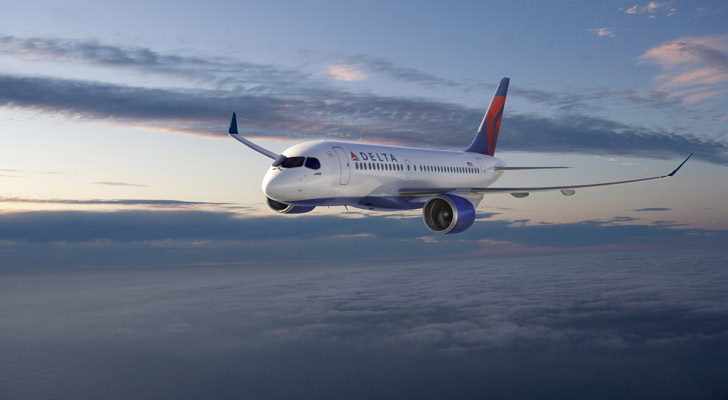 Delta Air Lines, Inc. (NYSE:DAL) is not a stranger to headlines. The airline industry is notorious for creating their own drama through flubs of handling customers, cargo or their own profit and loss statements. Just this week, we learned that DAL had a possible data breach incident. But recently, the industry got a boost of confidence from famed investor Warren Buffet. So for now, they have the benefit of the doubt from Wall street, and therein lies my opportunity. So far year-to-date, Delta stock has matched pace with the market and its industry. It has held well above the February lows and has not breached any of the meaningful recent support levels, so there is no severe technical damage to repair. Fundamentally, DAL is cheap trading at 10 trailing price-to-earnings ratio. This is cheap in absolute terms and relative to its competitors. Price-to-book is under 3 so owning its stock is not likely to be a financial disaster. The experts agree since all analysts that cover it rate DAL stock a BUY. Yet it still trades below all official price targets. But there is the danger that the longer it fails to close the gap, they could adjust their targets lower and that would have a temporary negative impact on price. DAL is not a growth stock so unlike analysts, I don’t want to bet on upside targets. Nevertheless, I am confident that if I own the shares at a severe discount from here I will manage my shares to profit in the long run. Click to Enlarge So I will use the Delta stock options to generate income with no immediate out-of-pocket risk. I have stronger faith in downside proven support than upside hopium. I see a major DAL pivot at $50.50 per share. This also coincides with an ascending higher low trend. Pivots usually are support but the ascending trend line also makes it a risk. If broken, price could retest $44 per share. While this is not a forecast, I have to account for its potential. So I will place my risk well below current price to increase my chances of success especially since we are going into earnings season. The Trade: Sell the DAL JUN $45 put for 60 cents per contract. Here I have a 85% theoretical chance of success. Otherwise and if the price falls below that level then I would suffer losses below $44.40. Those who want to mitigate the risk that comes with selling naked puts can sell spreads instead. The Alternate Trade: Sell the DAL JUN $46/$44 credit put spread which would deliver over 15% in yield but with much smaller risk. Both setups have about the same odds of success and neither require a rally to win. Get my free newsletter and subscribe to my YouTube channel here. Nicolas Chahine is the managing director of SellSpreads.com. As of this writing, he did not hold a position in any of the aforementioned securities. You can follow him as @racernic on twitter and stocktwits. Article printed from InvestorPlace Media, https://investorplace.com/2018/04/delta-air-lines-inc-dal-stock-limbo/.